Are you ready? It's coming. BEARMAGEDDON, that is. Day one (yesterday) of the 2017 Calgary Expo started not with a whimper, but a ROAR! 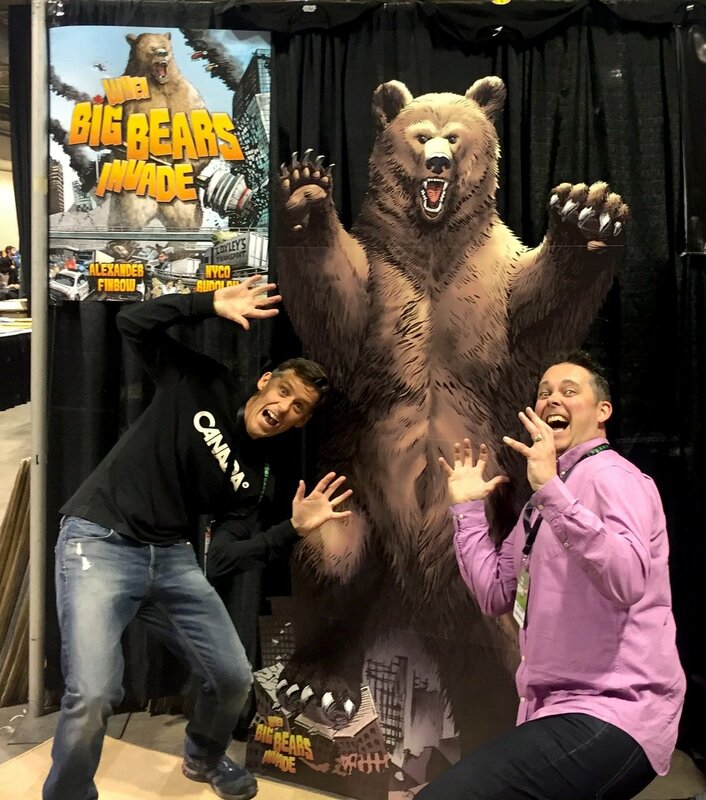 So, bear with me as I tell you a little bit about the interview I did with When Big Bears Invade writer, Alexander Finbow. And the book wouldn't come to life without epic illustrations by Nyco Rudolph and great logo, cover design and typesetting by Ryan Ferrier. Just in time for Canada's 150th birthday, why not have big bears destroy the country? So, if things like drowning Montreal in poutine, knocking towers down with the CN Tower and other great destructive behaviour sound like fun to you, then visit the Renegade Arts Entertainment booth this weekend and get your paws on a copy of this fun book. Plus, take a selfie with a giant bear! Now, hit play on the Soundcloud link and enjoy my interview with Alexander Finbow. And hey, while at the booth, check out some of the other offerings, including Loxley's and the War of 1812, Loxley's and Confederation, Redcoats-ish by Jeff Martin, and Arctic comics - the first anthology of Inuit of comic stories.